Brace yourself, The Wedding season is COMING! When your BIG day is just a blink away you’re coiffed and primped to an obsessive degree. In an effort to leave no stone unturned, one thing that dominates your mind is to look FIT & FAB! 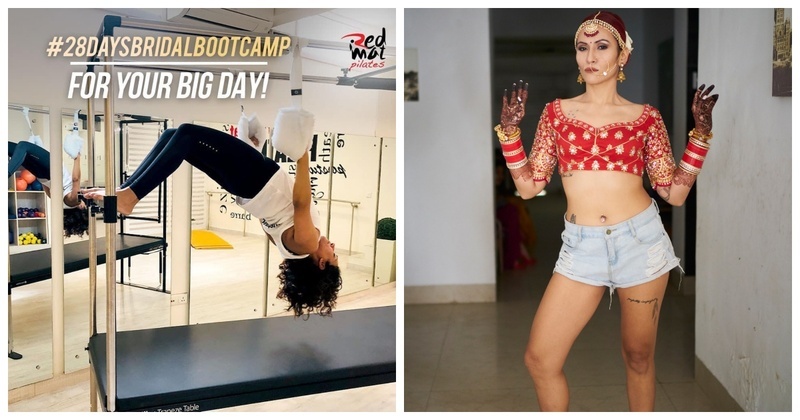 We’ve got a secret recipe to get you that perfect look on your D-Day -A #28DaysBridalBootcamp by one of India’s most loved fitness brand for Women- Redmat Pilates. Specially designed by celebrated Pilates expert & RedMat founder Taru Chaddha, this is a must consider program for brides-to-be and their tribe. It re-energises you & gets you the desired results in a short span! Pilates has undoubtedly become the hottest & bollywood’s favorite workout! Bollywood’s newly wed celebs like Deepika Padukone swear by its body-sculpting powers. You must be wondering what’s all in this bootcamp? The 4-week program will focus on overall toning of the body for the big day. Their mat classes are great for sculpting the abs and legs and improving the posture.For extra focus on the lower body the Barre classes held twice a week are great for toning the booty and calves. RedMat has also smartly added a once a week private session which focusses on your individual progress with an expert . This private session helps you fix the posture further for that regal look on your special day, along with special focus on arms, upper back and abs as these are the areas that are most visible in the wedding outfits. Something about their founder & Master Trainer Taru Chadha..
Taru is known for her exuberant teaching style and refreshing personality. She is set out on a mission to share the learnings that she gained through Pilates with the rest of the world. Her ability to combine fitness and fun has attracted so many satisfied clients including athletes, CEOs and celebs. She is a fully certified STOTT Pilates trainer and also a level 2 NKT (Neurokinetic Therapy) certified trainer in India which adds on a lot more to her expertise and offerings as a rehab specialist. She is currently studying the Fascia science to further, build her expertise in movement and pain management. Redmat currently has 3 facilities in Gurgaon & South Delhi and has proudly helped over 2000 women get fitter in the past 5 years. The company now also offers Online sessions for customers based outside of Delhi & NCR. Shoulders, and back, which we did for four or five times a week through a combination of private lessons and RedMat class sessions. So what are you waiting for Delhi-NCR brides-to-be? Get ready to transform yourself and to approach a healthier lifestyle. You can contact Redmat on 09205933669 or DM them on www.instagram.com/redmatpilates for joining the Bridal Boot Camp. If you are outside Delhi, speak/ write to them for their Online Consultation plans.